Who said the undead can’t live it up? 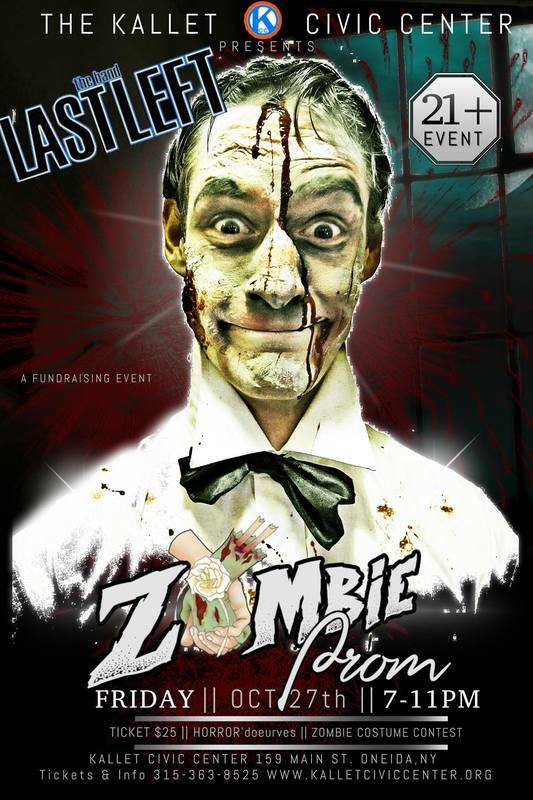 Come to the Kallet Civic Center in Oneida, NY on Friday, October 27th from 7pm-11pm for CNY ZOMBIE PROM. Come dressed in your Zombie Best, rot and decay are welcomed accessories. The deader…the better! And of course what night of the Walking Dead wouldn’t be complete without hitting the dance floor to one Central New York’s hottest bands, Last Left! Brush up on your Zombie skills because they can be put to the test in any of our fun contests throughout the night. And make sure you’re in costume for your chance to be crowned Prom King or Queen and don’t leave without getting your formal prom photo! Tickets are $25 per dead and will go on sale 9/22/17. The event is a Kallet fundraiser to benefit future programming and improvements. The event is 21+ only-so have your ID ready at entry. Each ticket includes one sample taste of our undead brew and Horror’doeurves that will be served throughout the night. Studies have shown that the undead have slight difficulties when it comes to navigating their first CNY Zombie Prom so don’t hesitate to call or email the Kallet Civic Center to answer any of your frightful questions.